The drive was uneventful, and Barry and I arrived at the H.H. Ellis Technical School, where the convention is held, at about 9:15AM. Joe, Roger, and Greg were already there, so we got right to work setting up the table, deploying the troops, etc, and got it all done in less than 2 hours, so that we were ready to start pretty much at 11AM as scheduled. That we were able to pull that off is a tribute to now practiced teamwork of the guys, as well as the advance organization of the commands. This is a long view of the table setup, with the French and their allies to the left, and the Russians to the right. The buildings in the far distance are the small village of Borodino itself. 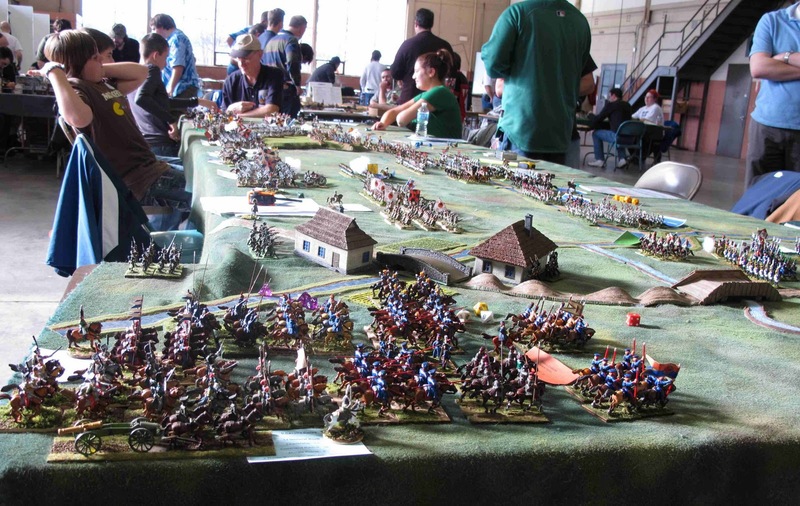 At the far end, there is a 6 foot wide by 6 foot long wing extending to the left, from whence Prince Eugene's powerful Corps advances. Speaking of this wing at a right angle to main table, and Viceroy Eugene's command, here it is! 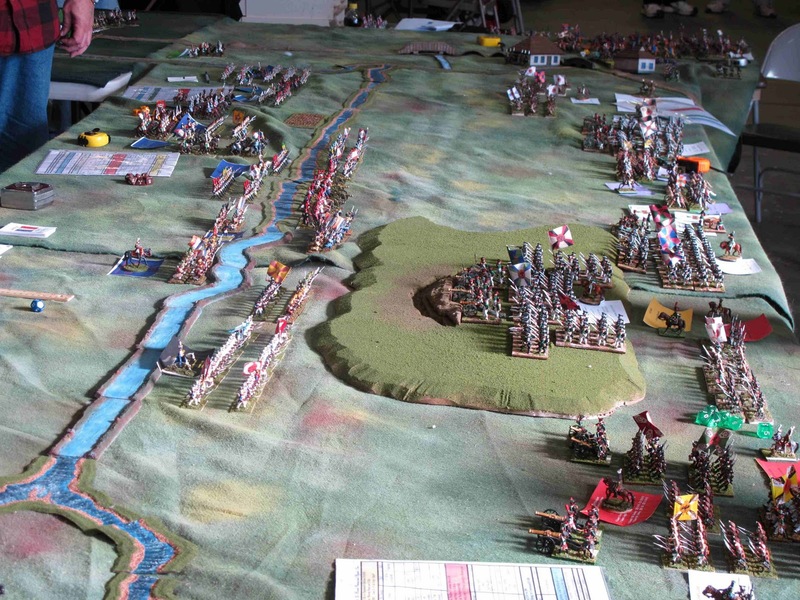 The battle was fought using the newly released 2nd edition of Brent Oman's Field of Battle rules by Piquet. Another shot of the set up, this time looking from Borodino, with the Russians to the left and French to the right. The far end of the table is in very bright sunlight at this hour - the convention is held in a high ceiling Aircraft Hangar, with extensive, tall windows at this end of the building. After I giave a very brief background of the 1812 campaign, and the Battle of Borodino, fought on September 7, 1812, the game got under way. From memory, so I may get some names wrong, on the French side Corey and Greg commanded Eugene's powerful Corps, followed by Roger with Junot's Westphalian Corps, then Matt with half of Ney's Corps, then Larry with the other half plus the Vistula Legion, and finally Laura, with 2 Cavalry corps, those of Montbrun and Nansouty. 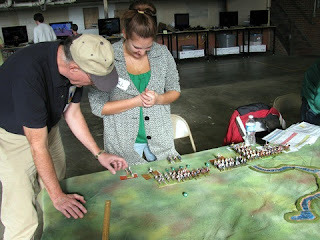 Here I am reviewing Laura's forces with her as she rolls a "Triple Magic Move" at her first opportunity! Not one for half measures, Laura boldy moves her first Division, Pajol's Light Cavalry, the full 36" forwards! "Hullo there, Ruskis!" For the Russians, Joe has the defenders of Borodino, plus Platov's Cossacks, Barry has the Russian center, including the Great Redoubt, then Matt #2 had the Russian Imperial Guard Infantry, followed by Jeff with Ouvarov's 1st (Guard) Cavalry Corps, and finally Zach with General Siver's Cavalry Corps. Those are Zach's commanders looking a bit "exposed" to the French. 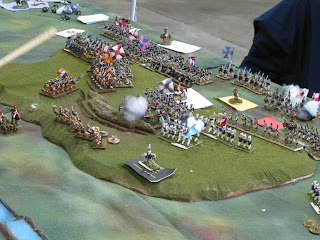 Close up of the conclusion of "the Grand Gallop" of the French Cavalry! The remainder of Laura's 2 Cavalry Corps thunder forwards (she only rolled double moves for them), supported by a French Horse Artillery battery. Well, as fate would have it, the French had won a big chunk of initiative to start the game, and a second French MOVE card was turned shortly. Rolling well once again on their Leadership Die, the French charged home! Here is the situation after the resultant melees were resolved - she went 2 for three, destroying a Russian cavalry unit and a horse battery, which was caught before it could even unlimber. Ouch! 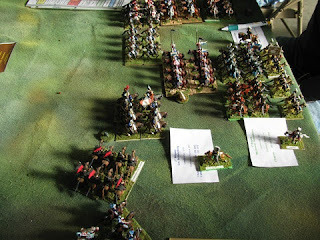 Another view of the aftermath of the Charge - that Russian flank is looking very vulnerable. The Russian player, Zach, took all this with admirable stoicism! Elsewhere, those French MOVES were bringing the infantry into the action as well; Ney's troops, with the Vistula Legion in support, are moving on Raevsky's redoubt; the hill and redoubt with ditch were scratch built by Barry. I used my Grand Duchy of Warsaw Poles to stand in for them, as the actual Vistula Legion troops for the July game (all 72 of them) are just started on my painting table. 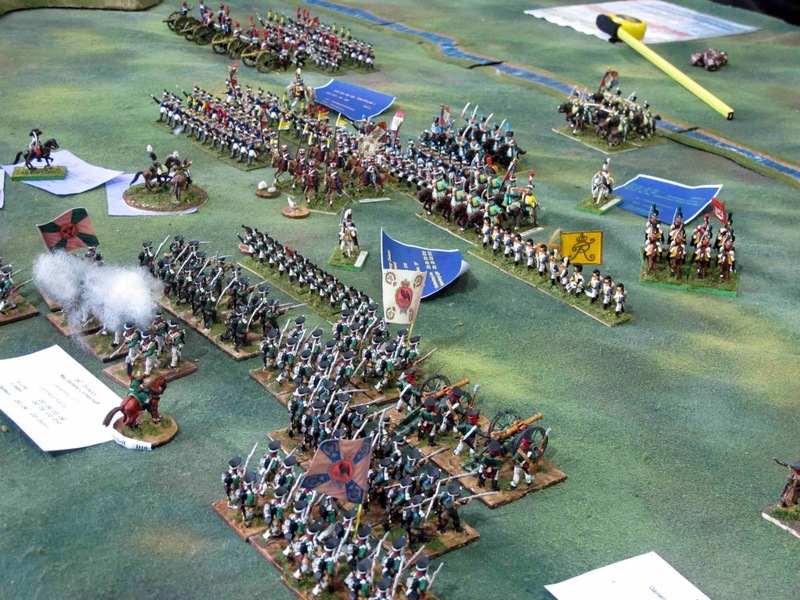 Eugene's massive Corps advances upon Borodino; as a result of this game, we will make some changes to the deployment and scenario to ensure that Eugene gets engaged sooner. Corey was very patient, but his troops needed to get engaged faster. The Russian defenders feel snug behind their ditch and redoubt! 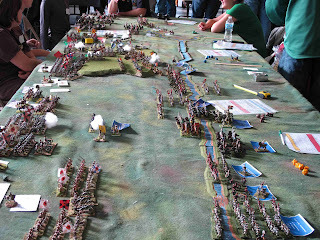 View of the table at this point from Borodino itself. 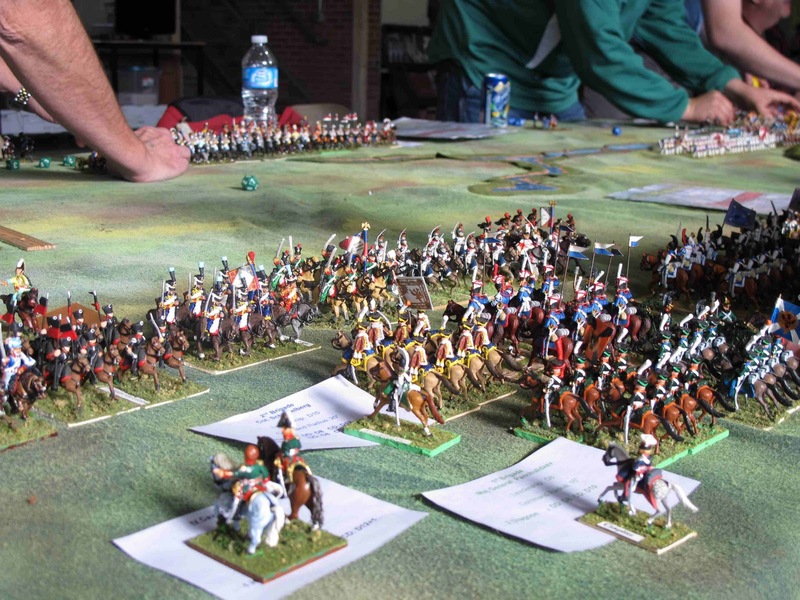 Eugene's troops continue to close on Borodino, while the Russians await their chance to disrupt their advance. The colored squares of paper are "Command Cards", and list each Command in the game with it's Officer and his ratings, and all of the troops in the command with their ratings. All the cards of a Corps have the same background color, making the lines of command fairly clear. Another view of the advance; evidently the French had the sun in their eyes! For this game, we kept the Command Cards with the Officer figures for clarity, although I had made up color coded labels for them so that the cards could be kept off the table for reference, thus reducing the clutter and "dirt"; we'll have to try using the Commander labels for the next game (we need to test out the changes to the Borodino/Eugene sector, plus the assault on the Fleches by Davout, and also Poniatowski's flanking attempt). 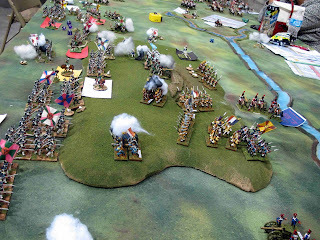 The French manage to get another MOVE card, while the Russian guns make good use of some ARTILLERY FIREPOWER cards. 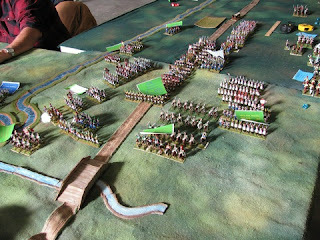 Junot's Westphalians are seen advancing in the Foreground (Jerome had already departed the army a month earlier in a fit of Pique over Davout having been given authority over his Corps when the two of them closed upon the Russians). Russian musketry mows down more than a few French assailants! Although it was far from the biggest battle of the Napoleonic Wars (Wagram, Leipzig, Dresden, and Bautzen were all bigger), Borodino was the bloodiest single battle of the entire 19th century in Europe ! 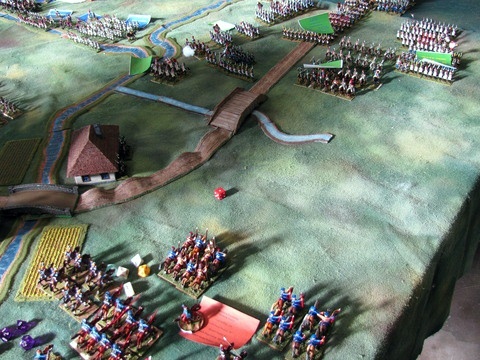 The remainder of Ney's Corps is engaging the Russians between the Redoubt and Borodino, with a Wurttemburg regiment in the lead. Note the French batteries in the background. ...but the Russians have plenty of Reserves available! On the far Russian right flank, the massed cavalry of Platov and Korff prepare to advance, the Russians finally having turned a MOVE card! Back on the Russian left flank, the MOVE has now allowed the the cavalry of Ouvarov (consisting of the Imperial Guard horsemen) and Sievers to charge themselves. As always in our games, the chickens, pigs, sheep, etc indicate units that are "Out of Command" (much like Disordered in other games), while rocks indicate Unit Integrity (UI) loss. A swarm of Cossacks beset Eugene's advance upon Borodino! We have added a special rule for Cossacks (and also the Russian militia "Opolchenie", which don't appear in this sector) for these troops, borrowed form Piquet's Archon/Band of Brothers 2nd editions. Their lousy D4 defense die type (compared with a D6 for most regulars, D8 for elites, and D10 for guards) makes them a choice target for artillery and musket fire. However, we are playing that they only cost a Morale point when they are destroyed or routed, not for each UI loss they suffer. However, once they rout for any reason, they are removed from play, with no chance to rally. This makes these troops fairly expendable, which is pretty much how we feel the rest of the army would have viewed them! 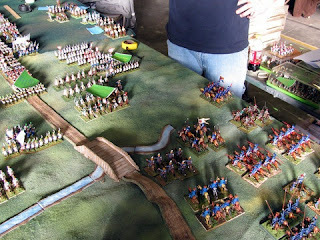 Some Cossack Horse artillery are deployed in support - Steve Barber Models from Barry's collection. The Viceroy has sufficient forces that he isn't overly worried by the approaching "Riders of the Steppes". 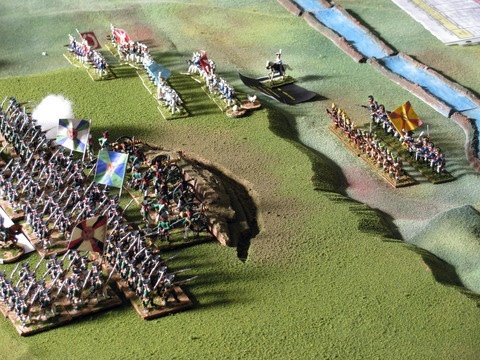 As the sun moves lower in the sky, the fighting around the Great Redoubt intensifies! Matt and Roger watch the fierce fighting around the Redoubt. 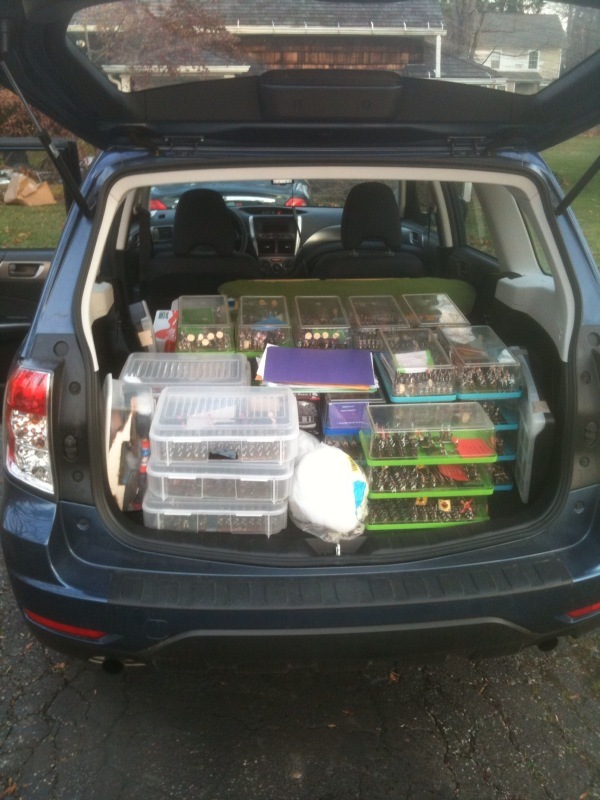 Matt has played in several of our past games, and is now pursuing a PhD at a nearby school, so we hope to see more of him at the Hartford area games. Joe and I first met in college as well, almost 40 years ago now, and that led to my meeting Charlie Sweet (and quite a few games at Charlie's house in Joe's hometown of Bristol, CT). 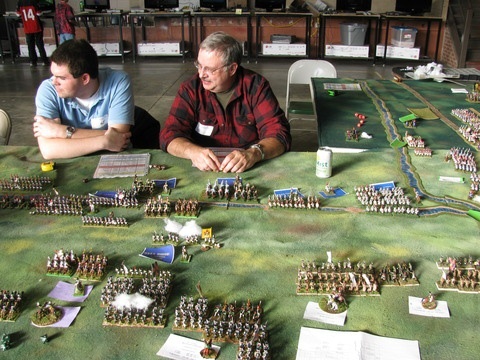 Charlie was one of the true "Old Guard" of our hobby; a true gentleman with a passion for toy soldiers, history, and games. 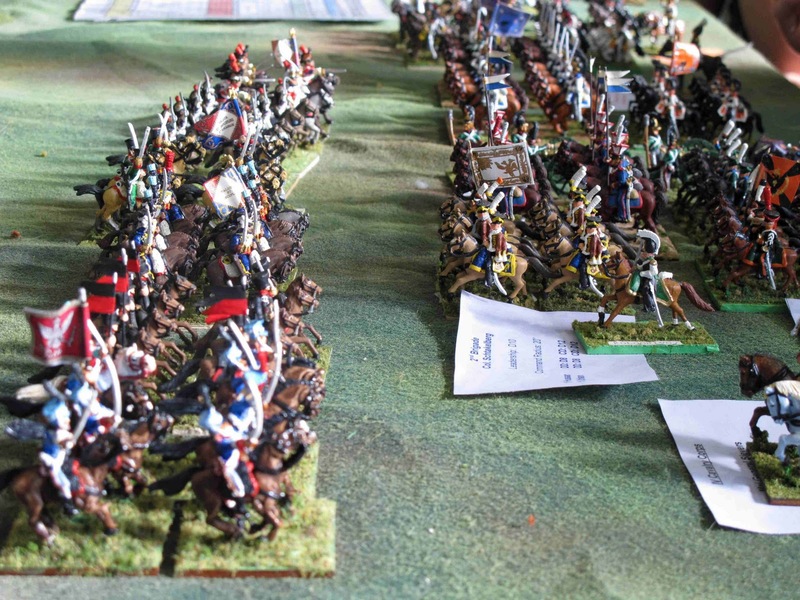 The French Assault on the Redoubt has achieved mixed results. 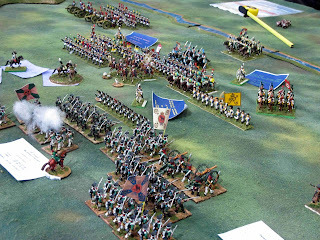 The better cohesion of the Vistula Legion as compared with the French regulars is evident! 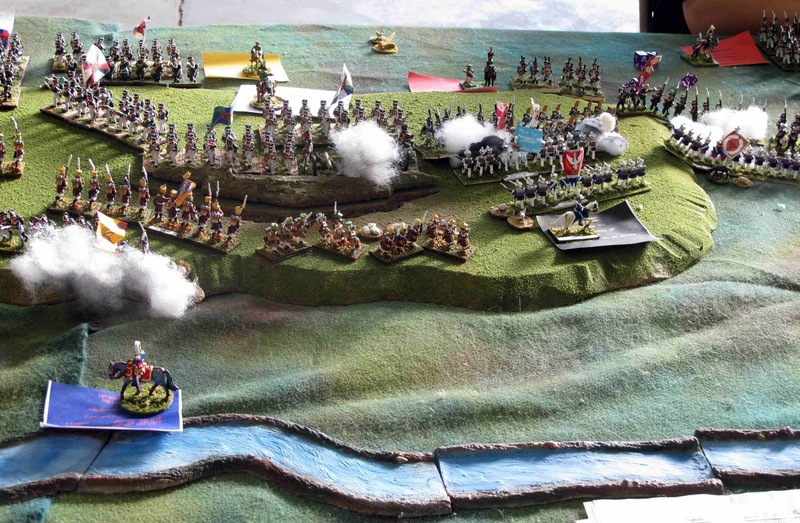 The Vistula legion had a complex evolution, but traced its origin back to Polish volunteers serving the French Republic as early as 1798; the 1812 campaign was their first chance to really come to grips with their traditional enemies, the Russians. "You're a Polish soldier and you have a German coming at you from your right, and a Russian from your left! Quickly now, who do you shoot first?" "That's an easy one - the German!" A final push by the French attackers on the fourth French MOVE card pushes all of the Russian defenders back from the Redoubt, routing several units, which later exited the table. This was a bit of a surprise to the Russians, as usually there are only three MOVE cards in an army's Sequence Deck, but Napoleon came up with a Superior deck, even though Borodino was far from his best day as an Army Commander; evidently a severe cold that he was suffering from hampered his usual efficiency... or that's the excuse that history gives! A different view of the situation around the Redoubt at the end of the Turn (which represented about 4 hours of combat, about the same length of time it took to play). 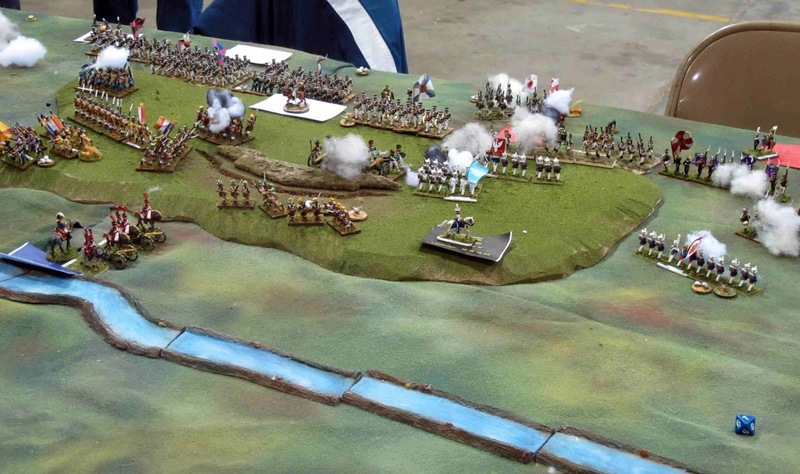 Back on the Russian far left, the massive cavalry action has swirled, ebbed, and flowed into a confused tangle of flanking and outflanked horsemen of both sides, with the Russians gradually gaining the upper hand. Here the Polish 13th Hussars (in the light blue shakos) has just completed a bold charge into the flank of some Russians, and threatens the rest of the Russian rear! Both French and Russian cavalry died like flies on this day, with two French and one Russian cavalry Corps running out of Morale Points in short order; no one failed their Corps Morale roll (done on the appearance of the ARMY MORALE CHECK card, however! The Russian Imperial Guard Infantry and Artillery are the anchor of this side of the hill on which the Grand Redoubt is located; that's an awful lot of first rate troops for one Hussar regiment to tackle! At the top of the picture Matt #2's Guard Jagers are engaged in an ongoing firefight with a regiment of the Vistula Legion, commanded by Larry. A stray bullet has laid low General Lavarov, the commander of the Russian Guard Infantry Division! Note his figure tipped over on the red Command Card. On the ARMY MORALE CHECK card, all leaders who have had at least one unit in their command shot at or engaged in melee since the last AMC was turned must check to see if they were hit; a roll of "1" on a D20 (the rules call for a D12, but we use a D20) the Leader is hit, and all of the units in his Division are Out of Command. A replacement Command Group leader is generated on the next LEADERSHIP card, which is also the car that allows troops to be rallied and/or restored to Command. The position of the Polish (Grand Duchy of Warsaw) Hussars after their charge - Out of Command and down a unit integrity as well. In the event, the Russians drew a MANEUVER card, and the Horse Battery seen above, which had retreated from an earlier melee, unlimbered and blasted the audacious Poles to smithereens! Shortly thereafter, the Sequence decks were exhausted, and with the hour advancing and take down and the drive home looming, we decided to halt play at that point. It was a very hard fought action, that also pointed up the need to make some changes to the scenario. On the way home, Joe, Greg, Barry and I stopped of at the Pizza place/dinner a few miles form the HS, for some affordable but surprisingly good food, and great conversation about fine tuning the scenario further. 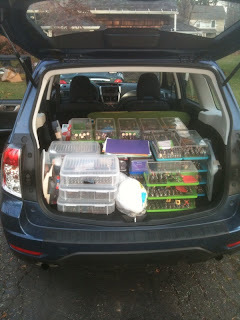 As we have the past three years, we had a great time at Ellis Con, and look forward to returning again next year. A small but worthwhile all genres gaming convention with several local dealers in attendance, Ellis Con is well worth the trip if you live or go to school in CT, RI, or central /eastern MA. I hope to see faces new and old there again next year! Hussars had all but vanished from the Russian army by 1784, however Czar Paul resurrected the arm, creating 8 regiments of line Hussars (Akhytrsk, Alexandria, Elizabethgrad, Isum, Mariupol, Olviopol, Pavlograd and Soum). In 1803 two more regiments were added, the White Russia and Odessa, but the Odessa was soon converted to Uhlans in 1805. The Grodno regiment was raised in late 1805, followed by the Loubny in 1807. In 1804, the strength of the Hussar regiments were increased to 10 squadrons each, plus 2 depot squadrons. As of late 1812, theoretically a Russian Hussar regiment (NOT including the Depot troops, stats from Nafziger) consisted of : 1 Colonel, 1 Lt. Colonel, 2 Majors, 8 Rittmeisters, 2 Staff Rittmeisters, 20 2nd Lieutenants, 5 Wachtmeisters, 10 Cadets, 10 Junkers, 90 NCO'S, 1,320 Privates, 1 Trumpet Major, 20 Trumpeters, 1 Quartermaster Lieutenant, 1 Treasurer Lieutenant, 2 Military Judges, 1 Greek Orthodox Priest, 2 Altar Boys, 1 Regimental Surgeon, 2 Battalion Surgeons, 2 Battalion Field Surgeons, 1 Regimental Bonesetter, 10 Barbers, 1 Hospital Supervisor, 10 Hospital Attendants, 1 Riding Master, 1 Wagon Master, 1 Regimental Scribe, 2 Battalion Scribes, 2 Scribes, 5 Gunstock Makers, 1 Armorer, 4 Apprentice Armorer, 1 Saddlemaker, 6 Apprentice Saddlemakers, 1 Veterinarian, 10 Apprentice Veterinarians, 12 Blacksmiths, 10 Carpenters, 2 Provost, and 27 Train Drivers. Total 1,900 - obviously not all combatants! Because of their large size, Russian Hussar regiments often operated in "Battalions" of five squadrons each. In all honesty, the Russian Napoleonic army can be a bit drab compared with some of the others, especially after 1809. 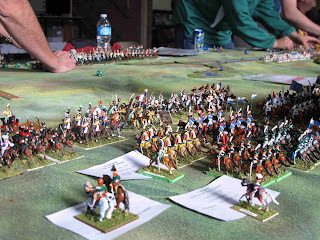 The Hussars, however are a riot of color, and probably my favorite troops in the army. This is well illustrated in the following tables, which give the uniform distinctions of the individual regiments. For all regiments, pants were white for full dress, and grey otherwise. * Raised 1812 from remnants of Irkhutsk Dragoons and augmented by the Duke of Saltikoff’s Hussars (volunteers), whose uniforms they retained. According to the uniform regulations, the barrel sashes were to be in the colors of the pelisse and the braid; thus the Pavlograd regiment would have turquoise and yellow barrels. Exceptions were known, however. First up is one of the newest units in my collection, just completed yesterday! This is the Alexandria Hussars, in their black dolman, pelisse, and pants. These highly animated figures are Old Glory (28mm). As usual in the Russian cavalry, the trumpeter has a red plume, as well as "wings" on the pelisse in the lace color, and is mounted on a grey (or white) horse. Contrary to regulation, I've painted their barrel sashes red and white (instead of black and white). The fur lining of the pelisse is white for the men, brown for NCO's, and grey for officers. This is common to all Russian hussar regiments. The officers would also have braid in the corresponding metal (silver or gold), although by 1812 they were allowed to forgo this very expensive adornment! The next unit is the Akhtyrsk Hussars; try saying that name when you need to clear your throat! These are classic Minifigs, painted 20+ years ago, but still looking quite nice. The shabraques should really have a yellow wolves' teeth design instead of the straight edge seen here, and the portemanteau behind the rider should be a drab grey instead of being in the same colors as the shabraque, as I painted them. A nice view of the very handsome uniforms of this regiment. The Russian hussars didn't carry flags, but I gave them one of standard Russian Cavalry pattern anyway! A final view of the Ahktyrsk regiment; the cords of the shako are in the same color as the lace/braid, in this case, yellow. Once again, note the differing colors of the fur trim for troopers, NCO, and officer. Some more vintage Minifigs; this unit is the Pavlograd Hussars. The same comments apply to the shabraque edging and the portemanteau as for the preceding regiment. The turquoise pelisses make a striking contrast to the dark green of the rest of the uniform. This unit actually *did* carry a standard of honor, awarded to them in 1805 as a special distinction! As the regiment has yellow braid, the shako cords should be yellow as well. The Osprey [The Russian Army of the Napoleonic Wars (2): Cavalry 1799 - 1814. Phillip Haythornwaite and Bryan Fosten (illus)] actually shows a trooper in campaign dress 1813 with *red* cords on the shako, without commenting upon it at all. The second of the two Hussar regiments I just finished painting, this is the Isoum regiment, once again 28mm Old Glory figures. The camera makes the blue look lighter in color than it actually is. Another view of the Isoum Hussars; I've left the flag off the standard bearer figure (so far); in 1812, many of the hussars were equipped with lances as well, so while while awaiting their flag we can just pretend this fellow is one such! A final view of the Isoum regiment; the tall, narrow plumes on these OG figures are impressive, but probably rather prone to breakage! Back to the vintage Minifigs again; this regiment is the Soum hussars, wearing perhaps my favorite uniform of the bunch. The grey pelisse and dolman accentuated by red collar and cuffs is very striking, I think. 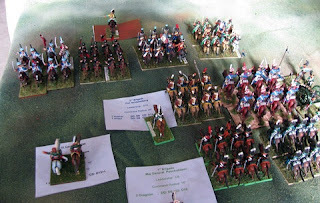 Another view of the Soum Hussars; note the red breeches. No dull campaign wear for them! One final view; note the red sabretaches with white decoration/Imperial monogram. Once again, allowing the unit to carry a standard is artistic license! 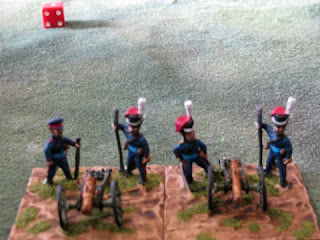 I hope you enjoyed these five colorful units; with the completion of the Alexandria and Isoum regiments, I have all my painting done for the partial Borodino scenario we're running at Ellis Con this weekend, Saturday November 19, in Danielson, CT. Never fear, I still have more troops to paint for the full size version we're running at Historicon in July 2012!